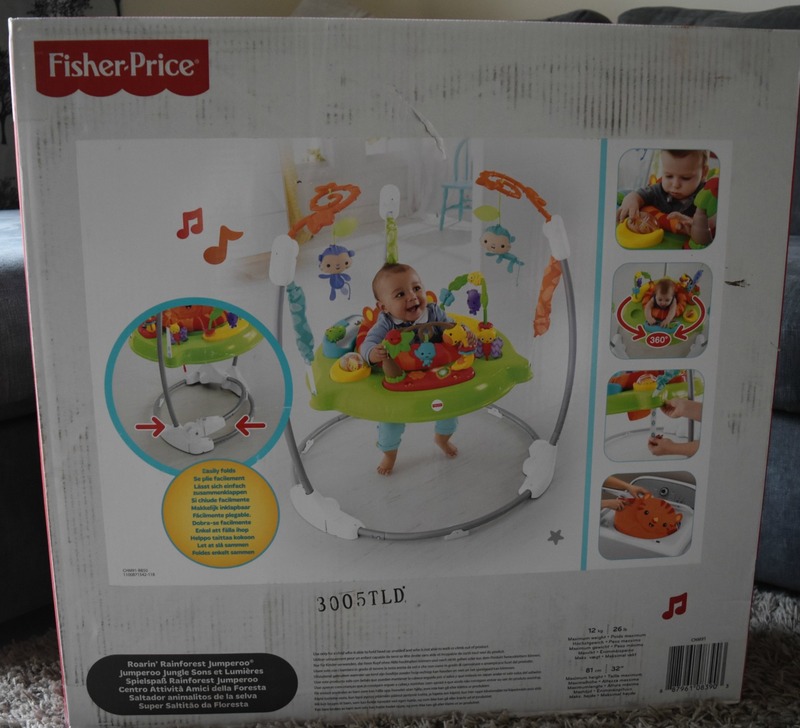 When Jack was younger he had as did many other children the Fisher Price Rainforest Jumperoo and it was by far the best baby purchase. 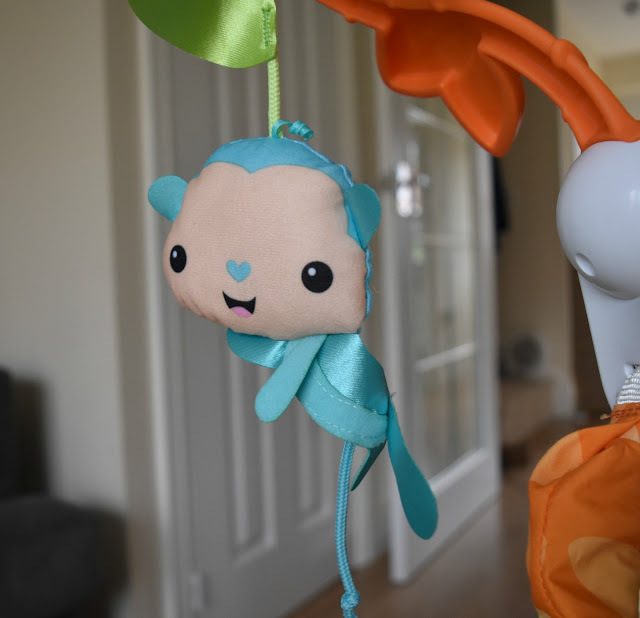 I always knew if I had future children they would be getting a Jumperoo if they were still in production. 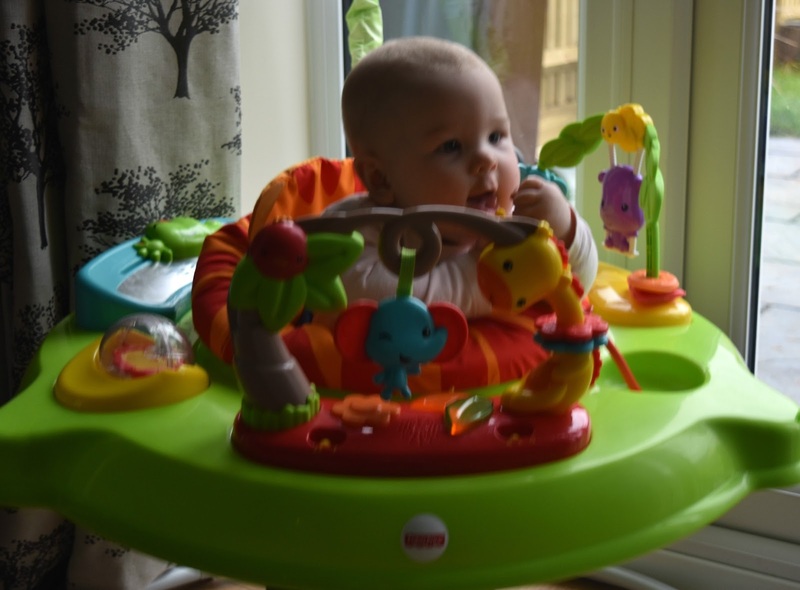 So, when Isla was offered the new Fisher Price Roarin' Rainforest design for review we jumped at the opportunity. 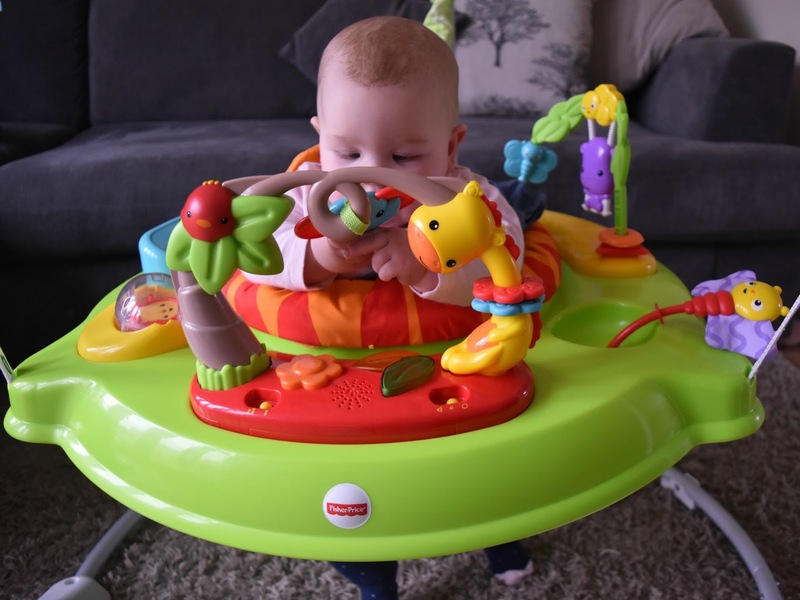 We were amongst one of the first to get our hands on the new Roarin' Rainforest Jumperoo, which was a little bit exciting in itself. The Fisher Price Roarin' Rainforest is the latest addition to the Jumperoo family, and has recently gone on sale. It has many features similar to the others with a few changes too. This new style is slightly larger than the older style we had with Jack, however this doesn't make too much difference, especially when folded away. However I do find this one a lot more eye catching and a whole lot brighter. 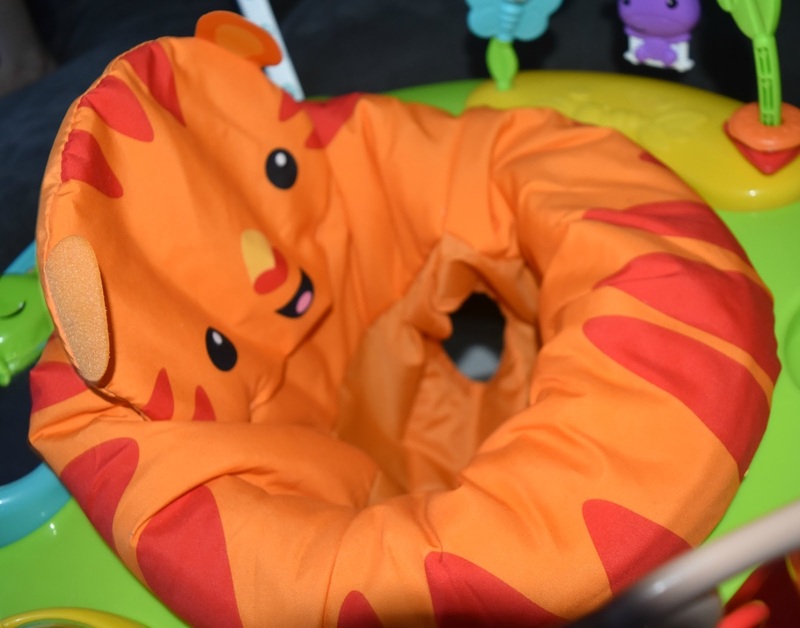 The entire unit, including the seat are eye catching keeping baby stimulated, the seat unit is a green with a bright orange tiger seat and bright activities too. The seat cover is removable enabling you to wash and dry it when your baby bounces a little too much and sicks, yes been there. 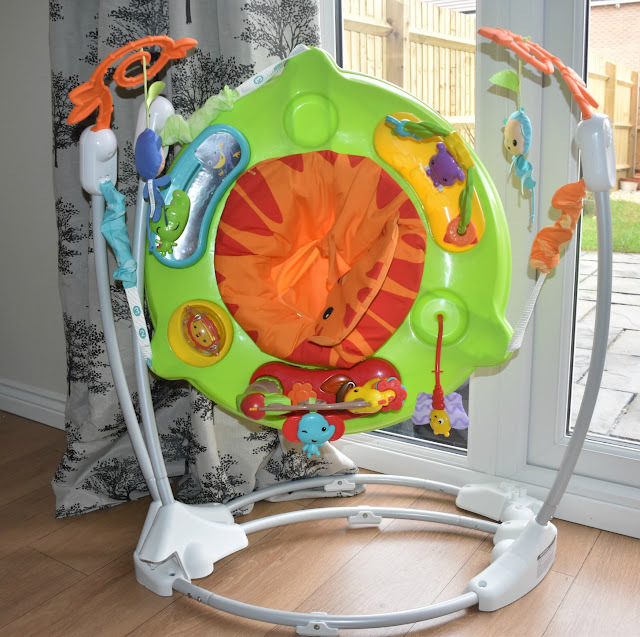 The 360° seat allows your baby to discover the entire range of toys and activities in which the Jumperoo has to offer. 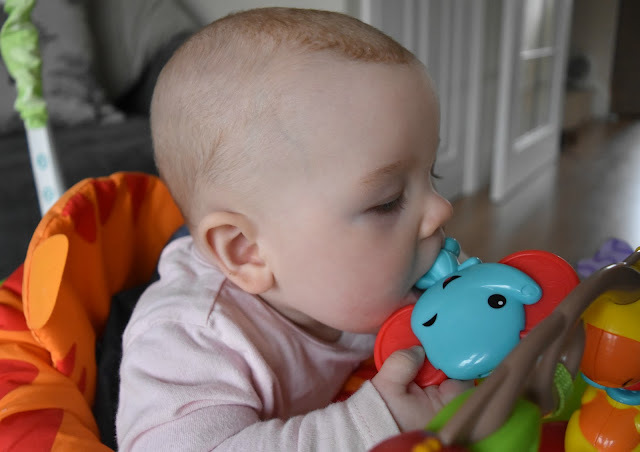 There is a wide range of bright toys including a butterfly teether, which Isla loves, a swinging hippo with some shapes, a sliding alligator which clicks as you move it and has a reflecting sticker behind acting a bit like a mirror, then a spinning lion which has some small beads in and then the front sound unit which has a swinging elephant on. The front unit is where the melodies are played from, which actually aren't that annoying. 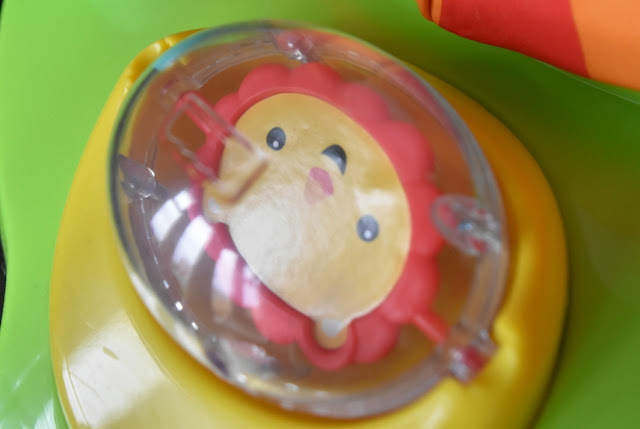 There are two sounds one which is movement activated and the other which is bounce activated. Each toy is fab,and all are a big hit with Isla, however her favourites are the butterfly teether and the lion. 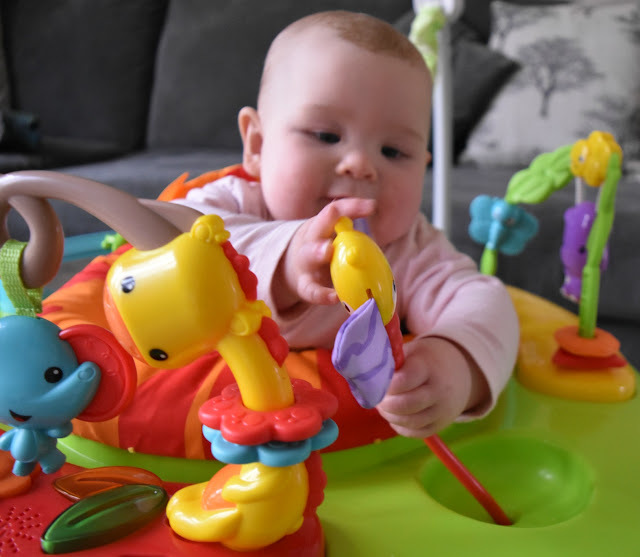 Parents generally have a love-hate relationship with the Jumperoo, as it's a fantastic way to entertain your baby and pre-schooler it seems and allowing you time to do some household chores or have a well deserved hot cup or tea. 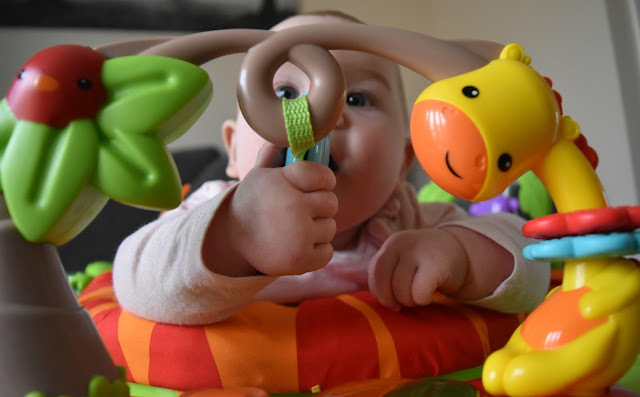 However they are quite large, and baby doesn't need them forever. 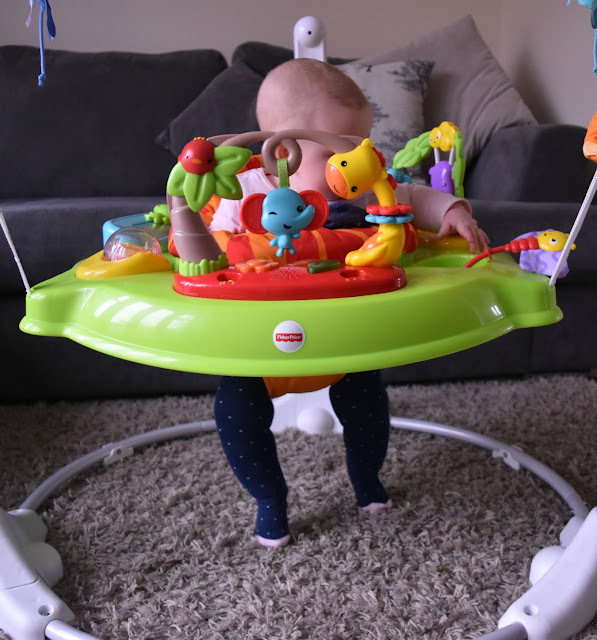 But, the Jumperoo actually folds, it seems quite a few people don't actually know this but the base of the Jumperoo folds up allowing it to be stored in a much smaller space.You simply take apart the one leg which is simply done at the press of a button, and fold into itself. The Jumperoo grows with your baby, so although it may initially seem like a large cost it's well worth it. The Jumperoo can be used from when your baby can hold their head unsupported until they are walking. 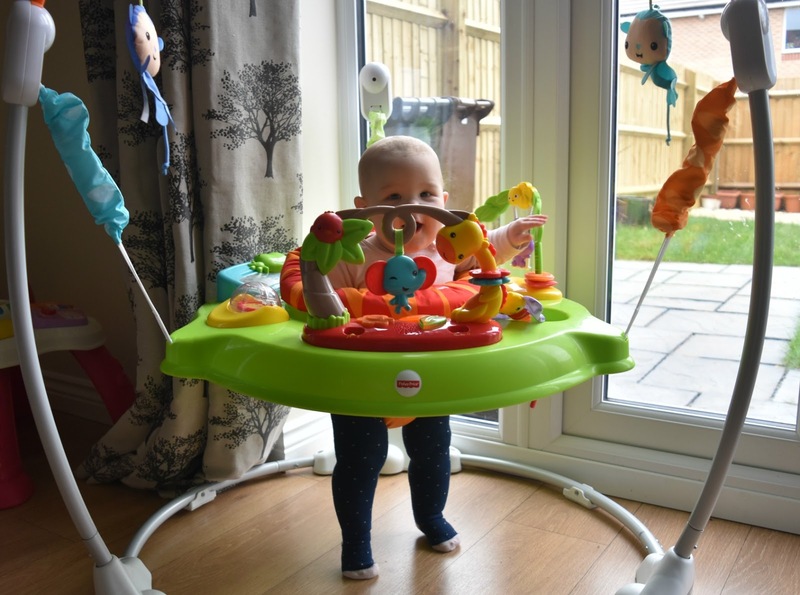 It has an adjustable height setting consisting of three levels, Isla is currently on the first level however as she grows we will be able to simply adjust this. 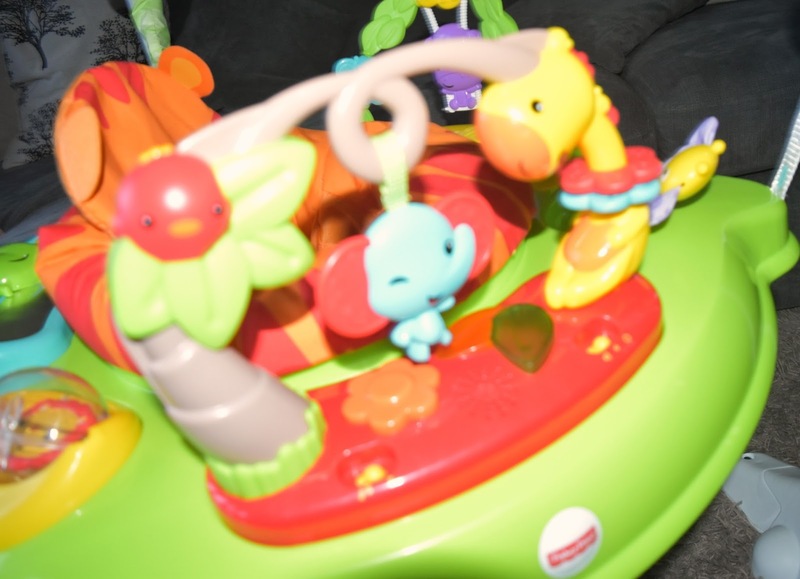 The Roarin' Rainforest Jumperoo is definitely something I would recommend to other parents. 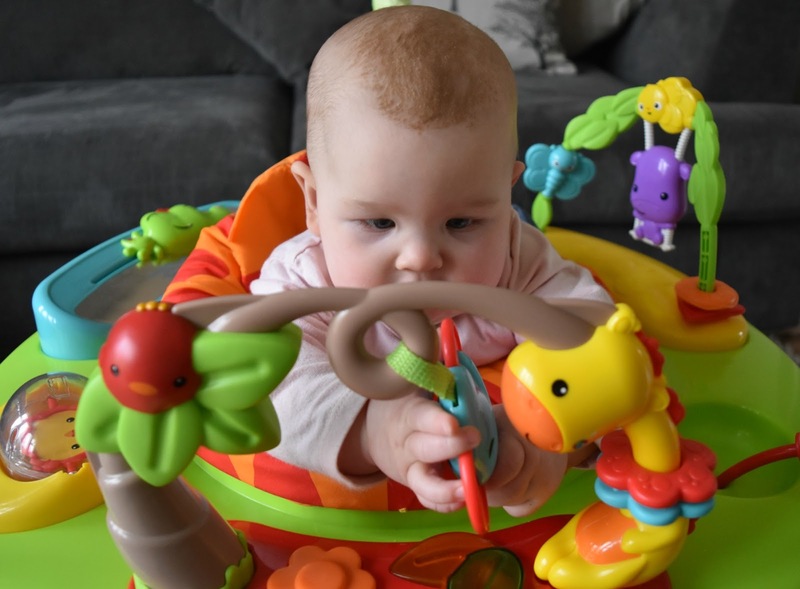 It is such a brilliant toy, not only for a hot cup of tea but also for the enjoyment baby gets from it. It retails at £119.99. You can find more information here. Please Note - I received this product in exchange for an honest and unbiased opinion which I feel I have given.